I’d like to begin this post with a little pre-blog-post disclaimer. A Halloween post…in the middle of April? If you’ve noticed the date that briefly appears at the start of each of our one minute videos you may have noticed that we’re running just a tad bit behind. 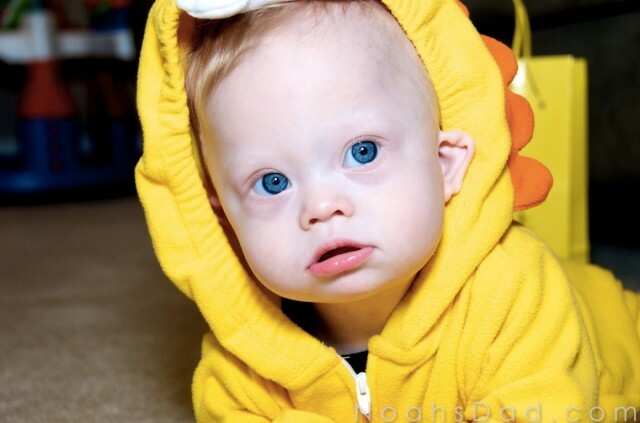 We enjoy telling our son’s story and giving the world a window into the life of what life is like for one family raising a child born with Down syndrome. Since we sharing this beautiful story of life in chronological order if, in the business of life, we don’t create a new post on a every day it creates a domino effect. Most of the time no one notices (or cares) that we’re running behind, however I didn’t want anyone to get confused when they saw a post about Halloween in the middle of April! 🙂 We have a plan to get caught up to real time over the next few months. 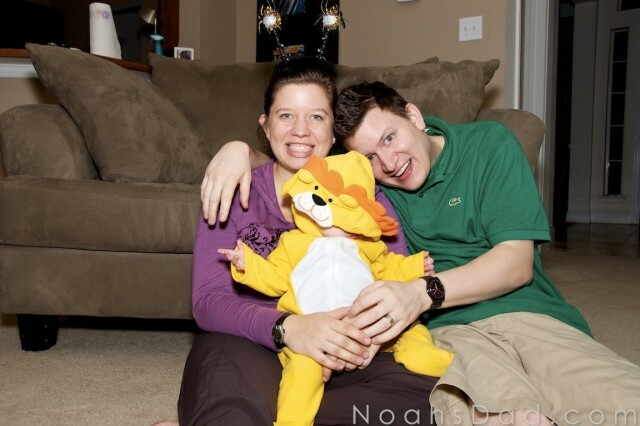 In the mean time I hope you enjoy the story we are sharing of our son’s life. It’s been a blast getting to know so many of our readers, and learning about your families as share your stories with us. Thanks for being so encouraging and supportive of our efforts. We really appreciate each and every one of you! First let me just say that before our son was born I’ve never googled “infant Halloween costume ideas,” searched Pinterest for the best baby Halloween costumes, or been exposed to how, umm….shall I say, determined, mothers can be when it comes to finding their child the cutest and most creative Halloween outfit the world has ever seen. Which leads to the first of two parent fails I’m going to be sharing in this post. 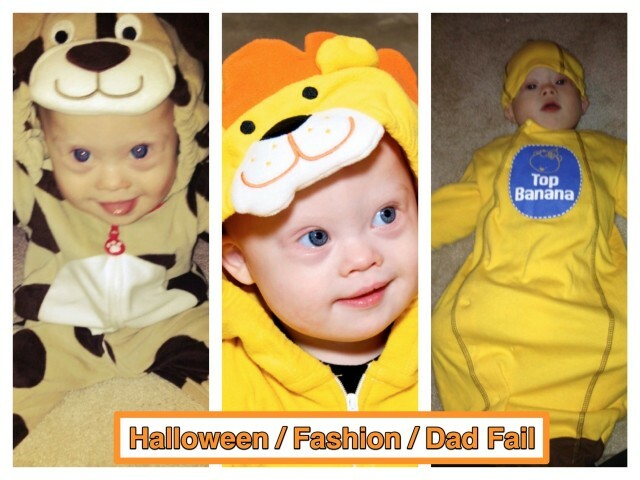 I know what you’re thinking…..
What’s so “fail” about a cute little 10 month old boy dressed up in a puppy dog, lion, and banana costume? Well it turns out dressing up your son as a puppy dog in the middle of December isn’t considered cute…..more like strange. But on the bright side, when his first Halloween finally arrived, he already had three super cute costumes waiting for him. Before I tell you about mommy’s fail, I want to tell you about mommy’s win. 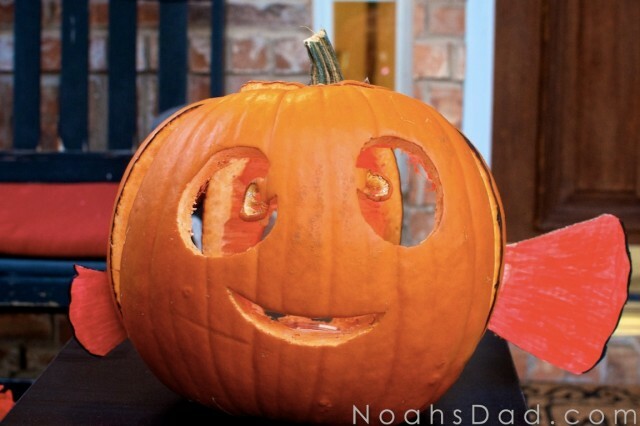 This amazingly awesome finding Nemo Jack-O-Lantern she carved! This was her first ever pumpkin carving. I think she did a pretty awesome job! 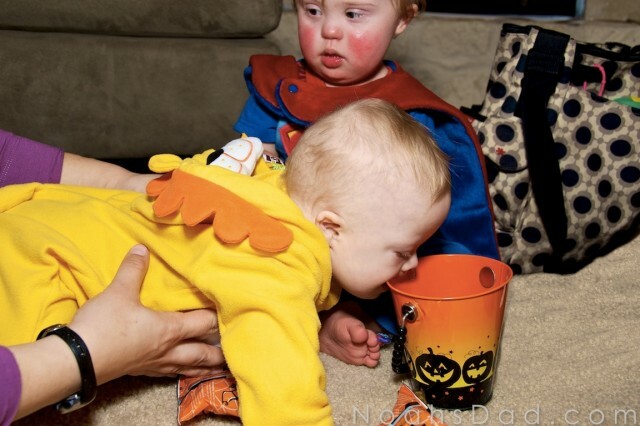 Ok, moving on the epic mommy fail….. 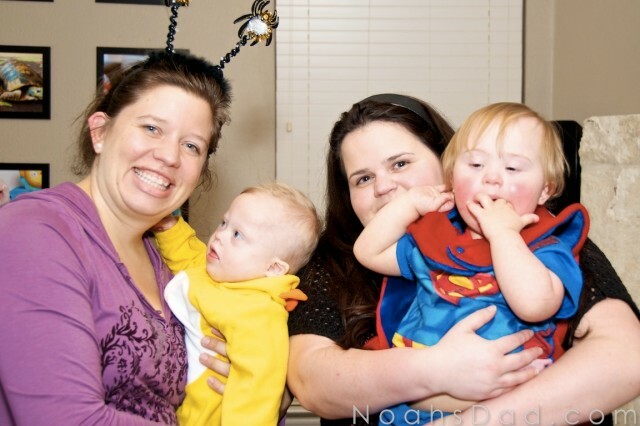 Since this was Noah’s first Halloween (or fall festival, or harvest celebration, or great pumpkin extravaganza, or as I like to call it; national trust a stranger day) and our first Halloween in our new house, we wanted to give out candy and meet some of our new neighbors in the process. 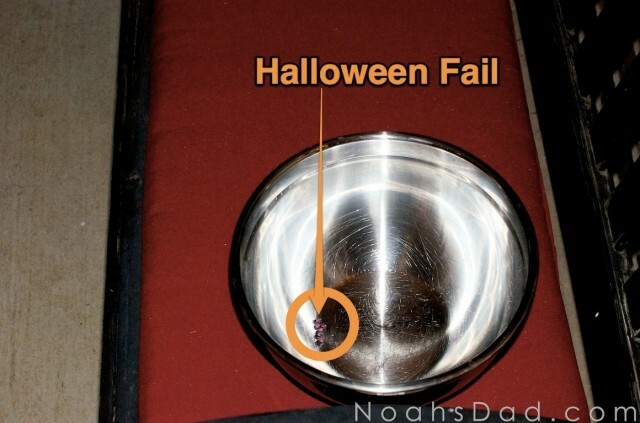 Well…no sooner then us crossing the street (and the first few sets of cutely dressed kids and their passionately candy seeking parents finding our bowl-o-candy) our once overflowing candy bowl was completely empty. With the exception of a few left over Nerds that someone managed to escape. Moral of the story? Never trust trick-or-treaters. 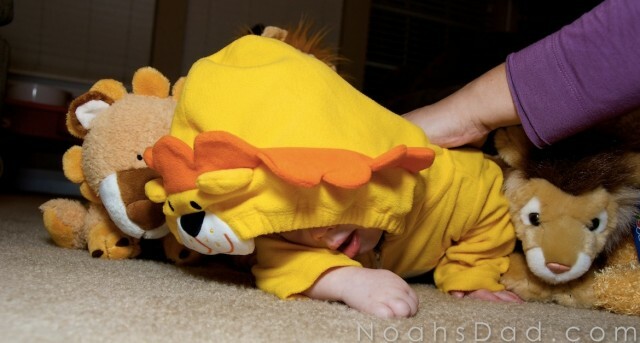 One cute lion costume, huh? We took Noah and his friend Austin Trick or Treating around our neighborhood tonight and I think they (or shall I say I) made out like a bandit. Are these two cute or what!? 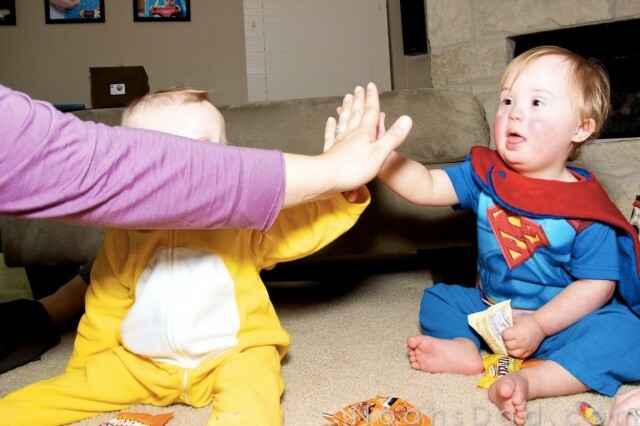 A super high five to celebrate their huge candy score! I know what you may be thinking…. Awww..just look at those two little angels. 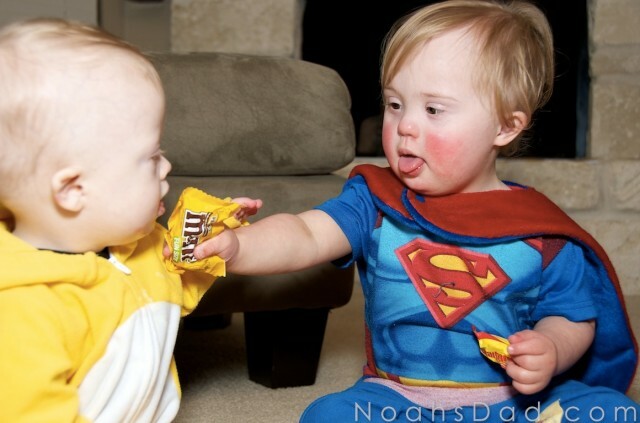 But, as I’ve said before, children with Down syndrome aren’t angels. 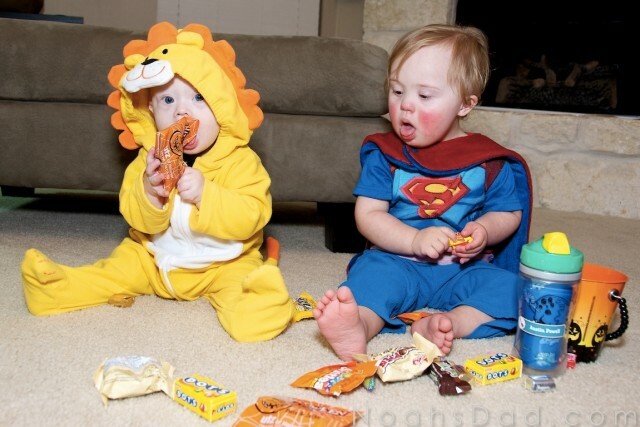 Sure, it’s super cute seeing Austin (aka superman) sharing his candy with Noah, but…. ….Noah’s not interested in Austin’s M&M’s. He’s got his eyes on a much larger prize. Austin’s entire bucket of candy! 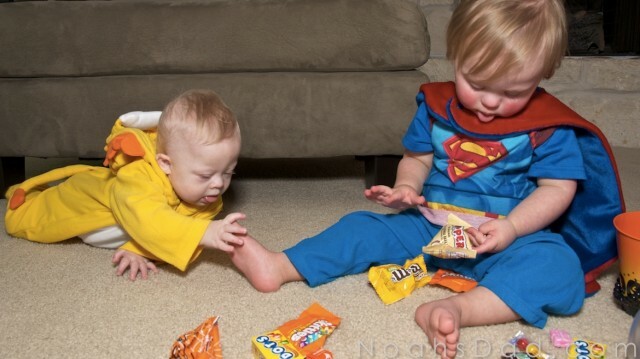 …and if he can’t get his hands on Austin’s entire bucket of candy, it’s all good…. ….because his feet will do! And if he can’t get his hands mouth on the feet…. 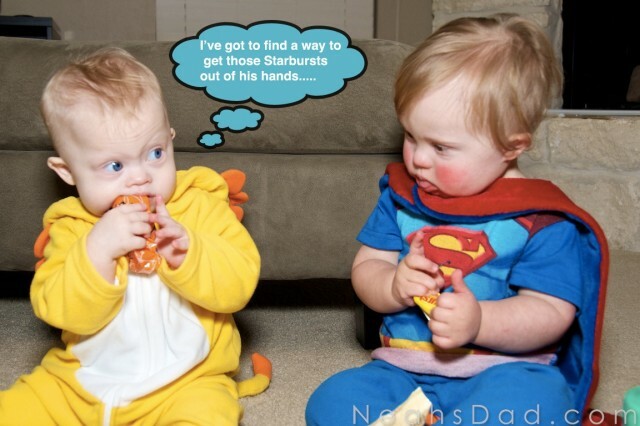 ….it’s all good again, because Starbursts taste way better than feet! And after all of that, he finally lands on some random generic candy. If only he would have taken the M&M’s. 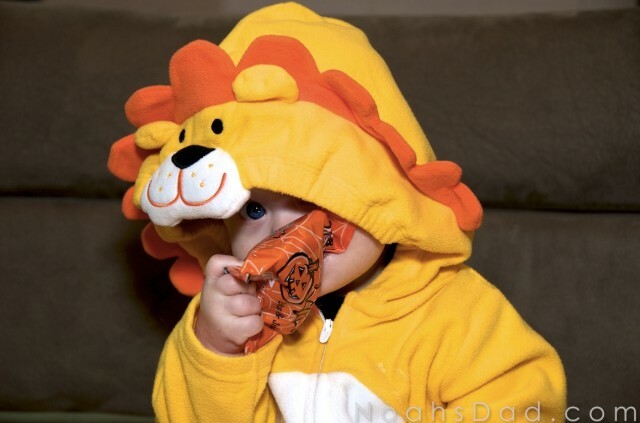 I’ve have a lot to teach my son about Halloween candy…..
We had a great time hanging out with Austin and his mommy, and we’re also super glad to have such fun friends living so close to us! The two greatest titles I’ve ever had. I’ve said this a million times being a dad (and husband) are the two greatest titles I’ve ever had. I can’t believe I get to wake up every morning and share life with these two. I really mean that. The joy that I get to experience daily in this house is beyond words. Don’t settle for counterfeit joy. Are there bad days, sure? Life has plenty of ups and downs. Highs and lows. Good days, bad days. But if you know the true source of joy, you know joy isn’t dependent upon any card life deals you. It doesn’t ebb and flow based on your circumstances. See...those lions are actually pretty tame. No, true joy is must more constant than that. Much more stable than that. Much more joyful than that. True joy, joy that never fades away, comes from the creator of joy, the Triune God. And while life’s various trinkets can sometimes seem to give us joy, it’s not real joy. It quickly fades. And when it does we find ourself on a pursuit for the next trinket. Life is more than just big bags of candy. I’m thankful that God has made a way through Jesus to show us that life is more than a collection of trinkets. That He has provided a way for us to experience true joy. Every single day of our life. I get to look into these bright blue eyes every single day! All you really want to do is take a nap. Oh and please be sure to take a second and leave your email below to stay up to date on our newest posts. 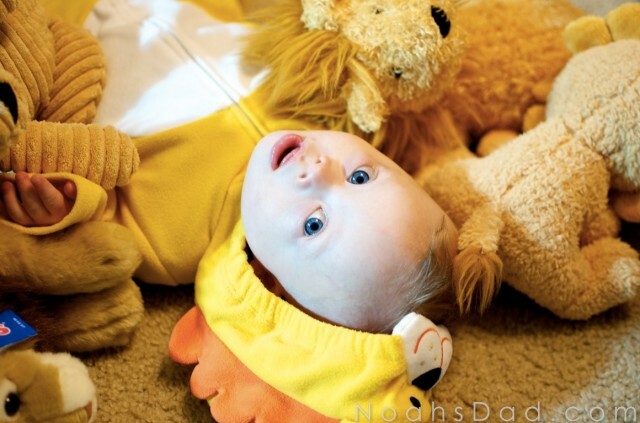 So cute…Noah is just a beautiful baby! 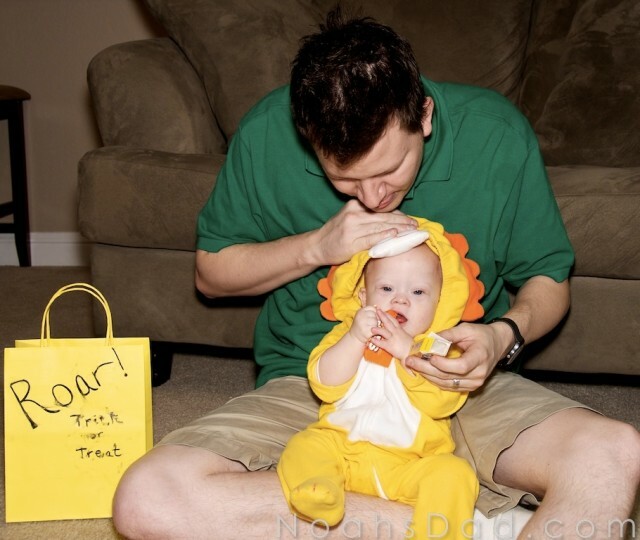 James was a puppy dog for his first Halloween, a cute furry puppy dog! I’m okay with seeing cute Halloween posts in April! Ryan is 4 now but his first costume was a monkey. He looked like Jabba the Monkey. 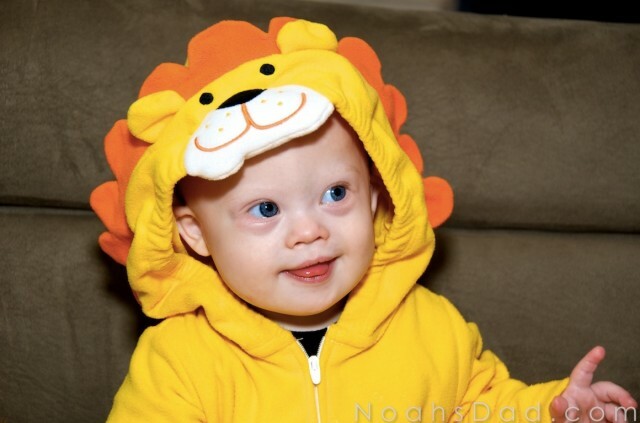 Noah is hands down the cutest lion ever!! 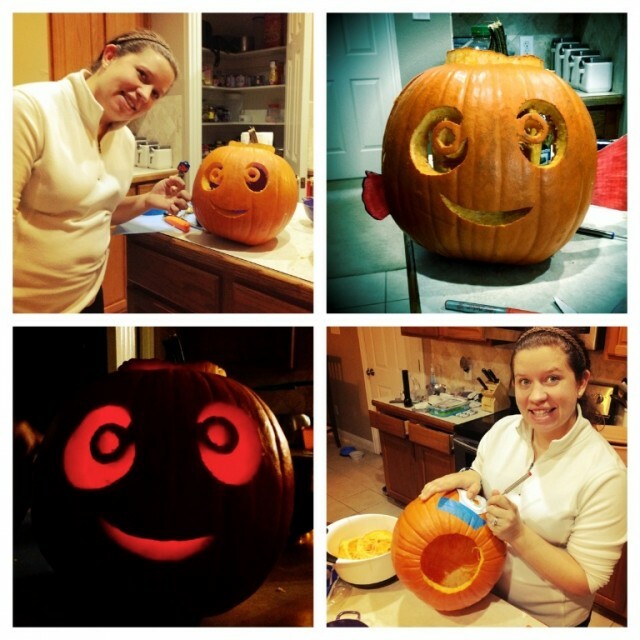 I have four kids, my oldest was a pumpkin for her first Halloween…….and yep, you guessed it, all three of the others were too!! Hand me downs rock, and also provide lots of sentimental value! 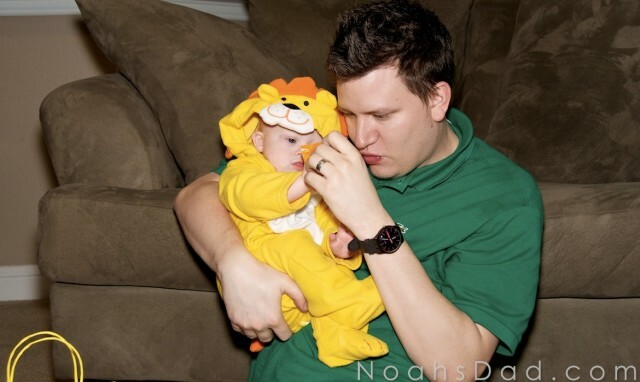 She’s now 30 years old, gave me the best gift ever in my grandson, who, yep….was a pumpkin for his first Halloween too!! Awww…thanks for the kind words, and yes, hand me downs do rock! How old are your other kids by the way? adorable kids! besides loving the pictures I also love the captions! Rick you are too funny! Thanks. You are to kind. Do you have any children? 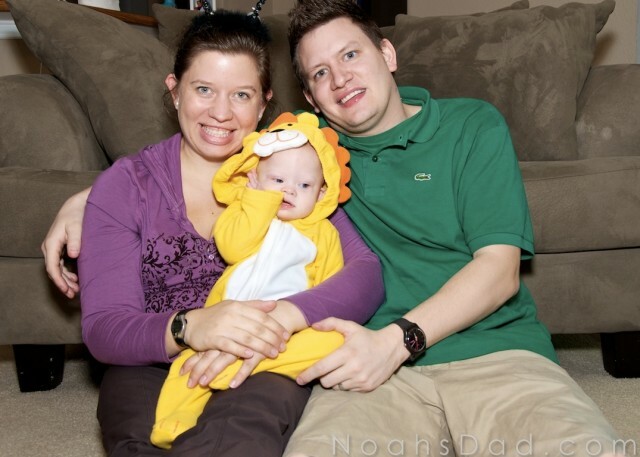 Noah is very cute in all 3 costumes!! Here are a few of Jamie’s past costumes. Too cute.Thank you for making my day!!!!!!!!!! Hope you are doing well. It was great to talk to you when we were doing our radio interview last month. here is a picture of my sweet angel Colin. he got his wings in Jan of this year. I remember he was so not impressed with his costume, but I know he was soaking up all the attention it was getting him from the nurses!! My boy was such a flirt!! He was about 6 weeks old in this picture. here is a picture of my son Colin, who passed in Jan of this year. I remember him not being impressed with being bothered, but obviously soaking up all the attention he was getting. He was about 6 weeks old. sorry…it didn’t show my original post…then when I posted the second one it showed up….ugghh computers.